Kerala VHSE Transfer Allotment result for admission to Vocational Higher Secondary courses has published on 28-06-2018. 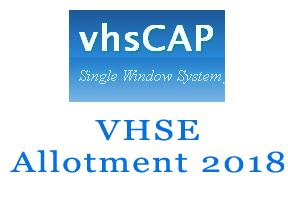 The VHSCAP allotted candidates can check their VHSE School Transfer allotment result on VHSCAP website www.vhscap.kerala.gov.in by using the link “Transfer Allotment Results”. The alloted candidates can take the print out of allotment letter from web site and should report to the alloted school on or before the last date. Enter your Application Number,date of birth and click submit button. All alloted candidates should report to the alloted Vocational Higher Secondary School before the last date.